Open daily from 12 noon till 2:00pm for lunch and from 6:30pm till 9pm for dinner. Three AA Red Rosettes for dining! Lochgreen offers unrivalled luxury and the finest dining in Troon, Ayrshire and indeed, Scotland. Our imaginative menus are created with flair by award-winning chefs, Bill and Andrew Costley together with Lochgreen's Executive Head Chef, Iain Conway and his team, using Ayrshire’s supreme produce! Our Kintyre Restaurant offers elegant, fine dining with wines personally sourced from around the world. Treat yourself from our A La Carte or Table D'hote menus with exquisite dishes to suit every taste. A nice enough experience that just missed in a few crucial areas. Sitting diners miles apart in a large dining area reduces an already flat atmosphere. Could have been a little quicker with the menus. The "musak" on endless loop was brain-meltingly banal. We heard an electronic keyboard cover of unchained melody 4 times! Bad enough the first go round! It would be great from an eco perspective if you house- sparkling tap water in reusable kilner bottles. The still tap water brought round very diligently by the cracking waiting staff tasted of fridge I'm afraid. Bread was a little plain, no choice offered and could do with an introduction and being warm. The butter was also a little insipid. Some black salt, seaweed, smoked flavours, even coffee butter (yes it's awesome) would have been better. Starters for everyone were lovely. It would be nice to know the salmon was wild especially with farmed salmon being so prevalent in the news at the moment. The duck caouslet terrine was nice. Needed something pickled. Perhaps some pressed soused cauliflower? The crustacean and grill menu was on the website but not available in house. The waitress very kindly brought three tiny, but delicious oysters on the half-shell with a belting fennel oil. Could have done a dozen! Yum. Chicken balontine main was fine. The sauce had a grind or two extra turns of the pepper mill which slightly overpowered especially with the peppery haggis fritter. The roast cod dish was almost a disaster. The roast  cod itself was perfectly cooked, but a little salty. The puree in the centre of the plate didn't look pleasant, but tasted wonderful. The chorizo chickpea combo was awful. Needs a total redesign. The pomegranate raita like dribble was completely wrong for the dish. Quite poor. I would have sent the dish back, had the cod not been tasty enough. Deserts were all good. The panna cotta was too set, and had way too much gelatin, but was tasty. Salted caramel tart and pineapple tart tatin were a success. Espresso was perfection. Petit fours were, as always, nice. Service was attentive, smart, polite, friendly, courteous and just the right amount of chatty. In the area on holiday in our Motor Home to celebrate my 60 th Birthday . Don’t know the area at all . Trip Advisor was used to find you for a lovely meal in a lovely place . Delighted with everything ! Booked online expecting Mother's Day Menu from your website , we were advised when we sat down , 6:45pm, in lounge for pre-drinks that this menu was for lunch only - per your web no mention of this, we expected this option to be available - more expensive dinner menu only. - service - for a well-established hotel we felt the service was very slow and not what we expected. Too many different waiters and confusion with party numbers when we went back to lounge for coffee - left the Hotel at 9:45pm and that was a quick coffee in the lounge! On a positive note the surroundings and food were excellent , disappointment with menu and service leads us to conclude that we would not recommend to anyone or be in a hurry to return. Despite email direct to hotel we have had no reply to our complaint. What a beautiful hotel, lovely staff and delicious food what’s not to like. I wish other hotels would provide this level of service, it makes the customer feel special. Although not officially opened after the refurb the service in the restaurant was great. Food was lovely in a great setting. Will be back. The food at Lochgreen is absolutely delicious as are the cocktails. The newly refurbished restaurant is beautiful. All the staff in the restaurant were warm and friendly as was David the concierge. We were of to a good start with glorious weather for a stroll in Troon before Lunch. Lunch itself was tremendous value for quality, quantity and presentation. Great welcome and service from front desk to departure. Perfect day out. Thanks. We had a brilliant stay at Lochgreen House Hotel  --  couldn't fault anything  -  thank you. Wonderful good and service as always, made our anniversary special as it did last year. Been many times but it was lovely to spend our special day at Lochgreen. Thank you all again. 5 stars for everything. We had the most wonderful experience, the staff were so attentive. The food was amazing. We felt very much at home.. we will be back! Mother’s Day lunch 2019 was an extremely disappointing experience at Lochgreen. 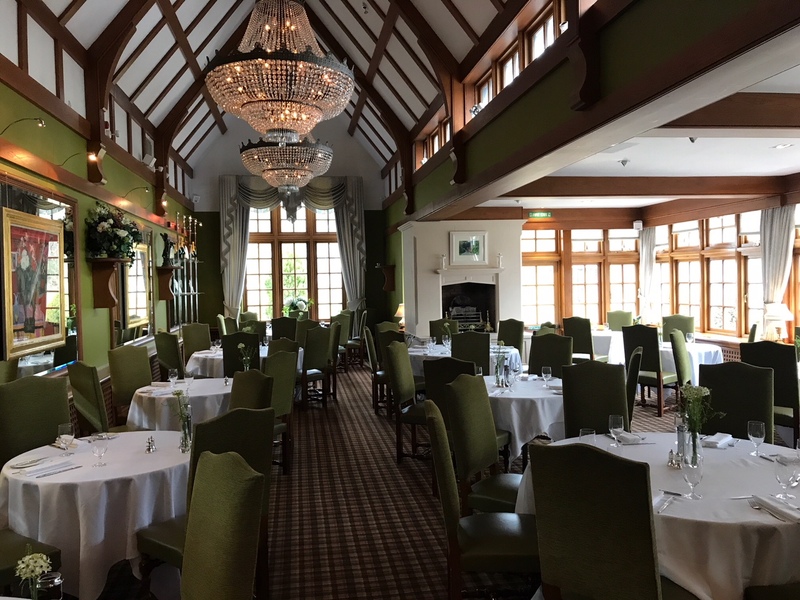 First, the lunch was booked for the Kintyre Restaurant, but, without any prior notice from the hotel, we were shown to the function suite since renovations to the main restaurant were behind schedule. A party of three with a reservation made many weeks in advance, we were taken to a table set for two and told to stand waiting while staff set another place and tried to procure another chair. Staff then changed their mind and directed us to a very unsatisfactory, dimly lit table immediately adjacent to the entrance staircase, where staff and guests were constantly traipsing behind. The hotel was squeezing far too many guests (or perhaps far too many small and medium sized tables) into an inappropriate space and the guest experience, as a result, was sub-standard. It is no acknowledgement or apology whatsoever to be told by management ‘wait ‘til you see the finished Kintyre Restaurant, it’ll be amazing’. That response presupposes we’ll return ... on the basis of our lunch experience, why would we consider returning? The waiting staff, though pleasant, were young and simply not as well trained as should be the case in a hotel of the standard that Lochgreen purports to be. The food was of a very disappointing quality - the kitchen evidently was struggling to cope with the demands of the day, which doesn’t augur well for the ‘all-day dining’ concept of the new Kintyre. Plates had been sitting on the pass too long with the result that dishes were overcooked. All of the dishes produced for our table were extremely underwhelming and resembled nothing like the standard that would have been produced by the Lochgreen kitchen of old. Elegant, fine dining this was not; the meal was more Brewers Fayre than The Buttery. The concierge, David, was exceedingly pleasant and most apologetic, but he should not have been put in the position of having to apologise to guests. Lochgreen used to be a firm favourite of our party, but yesterday it was a very poor reflection of its former self. J Carruthers. Mothers Day lunch fabulous menu of choices and food was delicious. Impeccable service unobtrusive and very efficient. Thank you we will be back! Staff were all amazing and friendly and the food was delicious. This was our first dining experience here. It was just perfect! From our arrival, sitting in the drawing room for pre lunch drinks. The decor and ambience made us feel totally relaxed. The lunch was delicious and aesthetically pleasing. We will certainly return. Worth the two hour drive! Superb food and super fast attentive service too...not just a meal, but an experience too. Great food, service and friendly staff. Had a lovely stay at the Lochgreen hotel. The meal was lovely, the accommodation first class and the staff very pleasant and helpful. Lovely lunch in beautiful surroundings and perfect service !